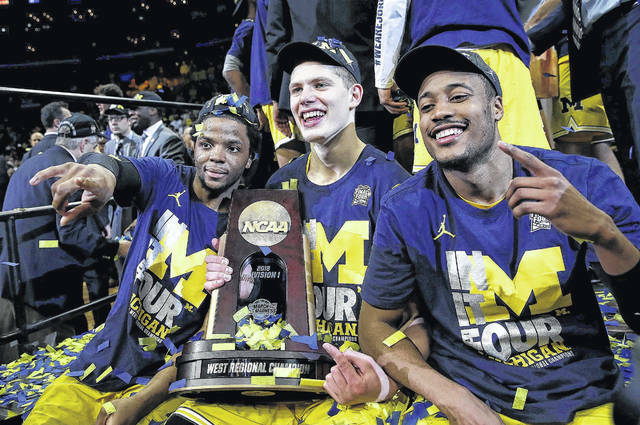 From left, Michigan’s Xavier Simpson, a Lima Senior graduate, Moritz Wagner and Muhammad-Ali Abdur-Rahkman celebrate Saturday night after defeating Florida for the West Regional championship. RALEIGH, N.C. — Michigan point guard and Lima Senior graduate Xavier Simpson is part of a group that could play critical roles in determining who among the Final Four ends up hoisting the trophy Monday night in San Antonio. Simpson is a defensive stalwart and one of the main reasons the Wolverines have become so good on that end, though his offense can be unpredictable. The 6-foot sophomore averages 7.5 points and 3.7 assists, but he’s capable of providing a double-figure scoring punch with his crafty drives to the basket and occasional 3-pointer (30 percent). He could also play an important role is Michigan is ahead late by being the man opponents want to foul; Simpson has made 45 of 88 free throws (.511). Others in the group include Kansas’ Lagerald Vick, Villanova’s Phil Booth and Loyola-Chicago regional hero Ben Richardson. Kansas: Vick started the year with a series of strong performances — and then abruptly faded for most of Big 12 play. The 6-foot-5 junior is back to playing reliably productive minutes again, and that’s a big reason why the Jayhawks are back in the Final Four for the first time in six years. Vick is averaging 12.2 points for Kansas (31-7), the No. 1 seed that emerged from a stacked Midwest Region to return to the site of its previous national championship in 2008. But Vick’s year has been almost three separate seasons: the strong opening 13 games, a slide into the background during league play — and a resurgence. Vick averaged 17.4 points on 56 percent shooting to go with 6.4 rebounds, offering enough hops and athleticism to be the team’s best dunker and a capable rebounder from the perimeter. That included a career-high 28 points in a loss to Washington, 25 more in a loss to Arizona State and 21 to open Big 12 play against Texas, leaving Vick — not Associated Press first-team All-American Devonte’ Graham — as Kansas’ top scorer as the calendar turned to 2018. But things changed. Vick’s numbers slid even as he continued to start and log 30-plus minutes. He averaged just 8.4 points and 3.9 rebounds while shooting 40 percent over the final 18 regular-season games, prompting coach Bill Self to frequently push him for more. But Vick has been in double figures in seven straight games going to the start of the Big 12 Tournament. And he had 14 points in the overtime win against Duke in the Elite Eight, including some solid high-post plays to attack the vulnerable middle of the Blue Devils’ zone. Loyola-Chicago: All the attention is on 98-year-old team chaplain and newfound celebrity Sister Jean, but Richardson is coming off a huge performance in the South Region final against Kansas State. The 6-3 senior is the only regular starter not averaging in double figures (7.0 ppg) but he scored a career-high 23 points on 7-for-10 shooting with six rebounds against the Wildcats. Villanova: This year’s Wildcats have a few players — including AP first-team All-American Jalen Brunson — who played in the 2016 title-game win against North Carolina. One of them is Booth, a 6-3 redshirt junior who was averaging just 6.7 points before scoring a team-high 20 points on 6-for-7 shooting off the bench in that win against the Tar Heels.